The Advanced Water Purification Facilities (AWPF) Ultimate Expansion project will increase the advanced water purification treatment capacity from 6-to 1-mgd product water. The $60M project includes additional MF, RO, and AOP systems and a balance of upgrades to existing pumping stations and systems, chemical addition system, auxiliary systems, and utilities. 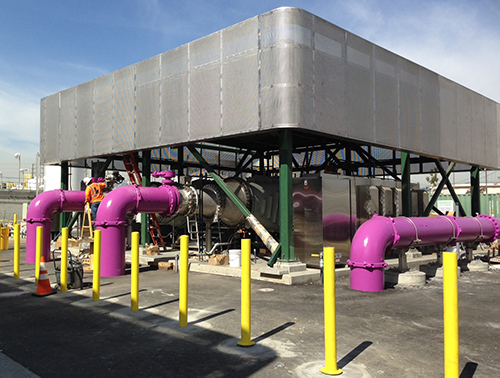 The advanced oxidation process (AOP) System using ultraviolet irradiation/sodium hypochlorite (UV/NaOCl) will replace the existing Phase 1 disinfection system. To operate AWPF at a constant flow and maximize production, the project also includes a 2-MG tertiary effluent equalization tank upstream of the AWPF. Doubles capacity of plant flow, producing 12 million gallons per day of advanced purified recycled water. Recycled water from Terminal Island AWPF is currently used at the Dominguez Gap Barrier for seawater intrusion barrier injection, protecting the quality of the West Coast Groundwater Basin. The Phase 1 AWPF, completed in 2002, has been operated successfully with a production of 5 mgd of potable quality product water. The existing AWPF includes Microfiltration (MF), Reverse Osmosis (RO), Disinfection (chlorination) and post-treatment with lime addition. The MF system was expanded by two CMF skids in 2012 to secure MF pretreatment and Phase 1 AWPF design capacity of 6 mgd. Post-treatment treatment is being replaced with NaOH and CaCl2 for pH control and limited re-mineralization, respectfully.